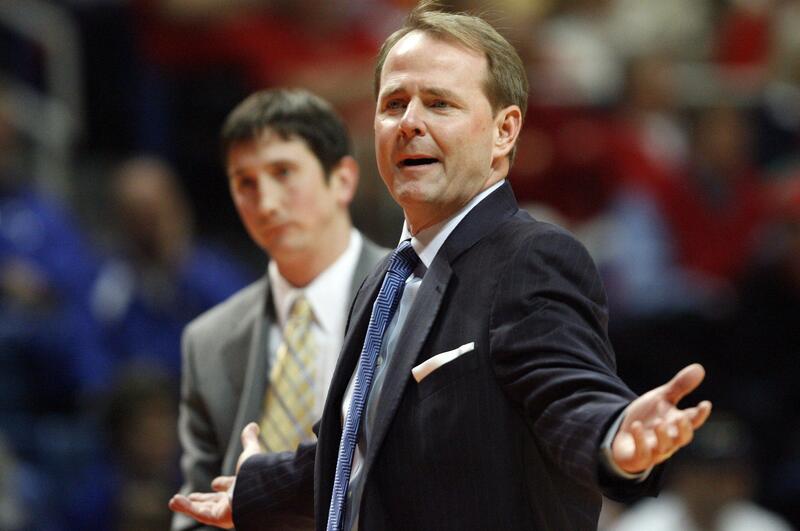 Middle Tennessee coach Kermit Davis has agreed to an eight-year contract extension that includes a raise after leading the Blue Raiders to an NCAA Tournament upset of Michigan State this past season. School officials announced Monday that Davis’ contract runs through the 2023-24 season and that he will make a total of $565,000 annually. Middle Tennessee athletic department spokesman Mark Owens said Davis’ base salary goes from $375,000 in 2015-16 to $465,000 in the new deal. Davis also makes $100,000 for radio and television responsibilities. The (Murfreesboro) Daily News Journal first reported Davis’ extension. “Accepting this extension no doubt shows the commitment that our family has towards Middle Tennessee State University and Murfreesboro,” Davis said. “When I reflect back to 14 years ago, walking into the Murphy Center which was an older building with different colored seats and gloomy hallways, I just saw the chance for growth. It’s great for us to have seen the culture grow. The wait is over for Tim Jankovich to be SMU’s head coach. SMU formally named Jankovich as its new coach, three days after Hall of Fame coach Larry Brown abruptly resigned. When Brown was suspended for the first nine games last season because of NCAA sanctions, Jankovich filled in as head coach and the Mustangs won all of those games. SMU went 25-5 last season, but couldn’t play in the NCAA Tournament because of a one-season postseason ban. Warriors forward Draymond Green was arrested on suspicion of assault in East Lansing, Mich., on Sunday, according to a court filing. The East Lansing Police Department arrested Green at 2:28 a.m., and he was released on $200 bond. He is scheduled for arraignment on July 20, according to the East Lansing district court filing. “If the NBA holds events in North Carolina while HB2 remains law, players, employees, and fans will be at risk of discrimination – and that’s wrong,” the letter said. The All-Star weekend is set for next February. Silver has made it clear the league needs changes to the HB2 law in order to stage the weekend there but has resisted setting any deadlines for when he might act, believing positive dialogue is ongoing. However, he has said a decision probably would have to be made this summer. The Atlanta Hawks and point guard Jarrett Jack have agreed on a one-year contract for next season. The Hawks will be Jack’s eighth team in 12 seasons. He spent the last two with Brooklyn, which waived him last month. Former running back Ricky Williams says he went through “at least 500” drug tests during his 11-year NFL career. U.S. women Olympic team to play against select team in L.A. The U.S. Olympic women’s basketball team will play against a select team on July 25 in Los Angeles before it begins a three-city tournament against France, Canada and Australia. Former WNBA center Liz Cambage has been included in a 12-strong Australian squad that is aiming to win a medal at a sixth consecutive Olympic women’s basketball tournament. This time, the so-called Opals want gold in Rio de Janeiro. Cambage, Laura Hodges and Rachel Jarry return from the squad which lost the semifinals to the United States at London 2012 and finished with the bronze. Penny Taylor and Erin Phillips return after missing the London Games. “Gold is always the goal – but we know there is a long way to getting the chance,” said Taylor, who has two Olympic silver medals and, at 35, will be the oldest member of the squad. The team includes former University of Idaho standout and Kennewick High School graduate Leilani Mitchelle, who played her senior season at Utah. She also played in the WNBA before going to Australia. Taylor plays for the Phoenix Mercury in the WNBA and has regular exposure to the top Americans. Australia coach Brendan Joyce left out three-time Olympic medalist Suzy Batkovic and picked seven first-time Olympians in his squad. Lauren Jackson, who won three Olympic silver medals and one bronze, retired earlier in the year because of knee injuries. Marianna Tolo, Australia’s highest scorer at the 2014 world championships, recently returned from a 10-month injury layoff for an eight-game trip to Europe to confirm her place in the Olympic squad. The Australians travel to Dallas next week for warmup matches against Canada, France and the Olympic and world champion U.S. team. The Opals open their Olympic campaign against Brazil on Aug. 6 and have group matches against Turkey, France, Japan and Belarus. Squad: Liz Cambage, Marianna Tolo, Cayla George, Stephanie Talbot, Rachel Jarry, Nat Burton, Katie-Rae Ebzery, Tessa Lavey, Leilani Mitchell, Laura Hodges, Erin Phillips, Penny Taylor. Andy Murray’s Wimbledon title allowed him to make a dent Monday in the still-substantial gap in the ATP rankings between him and No. 1 Novak Djokovic, last year’s champion at the All England Club. Entering Wimbledon, Djokovic had nearly twice as many points as No. 2 Murray, 16,950 to 8,915. But after Djokovic’s loss in the third round, and Murray’s third Grand Slam trophy, the margin is 15,040 to 10,195. Serena Williams’ seventh title at Wimbledon and record-tying 22nd at a Grand Slam tournament kept her at No. 1 in the WTA rankings, while runner-up Angelique Kerber jumped two spots to No. 2. The 34-year-old Williams, the oldest No. 1 in WTA history, has held the top spot since February 2013. Garbine Muguruza, who beat Williams in the French Open final but lost in Wimbledon’s second round, fell from No. 2 to No. 3. The agent for Ryan O’Reilly confirmed that charges against the Buffalo Sabres forward have been dropped stemming from an impaired driving incident last year. Pat Morris tells The Associated Press in an email that Canadian prosecutors found there was not enough evidence to proceed and dropped the charges against O’Reilly of impaired driving and failing to remain at the scene. The case has been dismissed. O’Reilly, 25, will be starting his second season with the Sabres after a trade from the Colorado Avalanche in the summer of 2015. Buffalo signed him to a franchise-record $52.5 million, seven-year contract after acquiring him. Published: July 11, 2016, 6:48 p.m.